Servicewomen (officers) are being turned out continuously to be able to take part in the defence duty of the Republic of the Union of Myanmar, and the passing out parade of the 5th Intake of the Graduate Female Cadets was held at the parade ground of the Defence Services (Army) Officers Training School (Hmawby) in Yangon this morning. 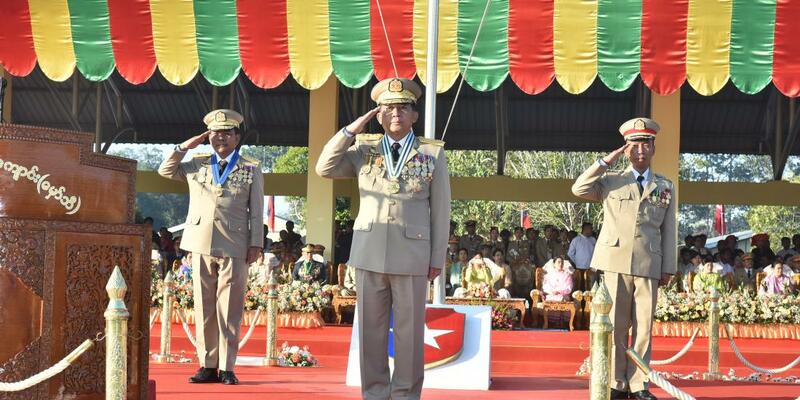 Commander-in-Chief of Defence Services Senior General Maha Thray Sithu Min Aung Hlaing attended the ceremony and delivered an address. Present were Daw Kyu Kyu Hla, wife of the Senior General, Union Minister for Defence Lt-Gen Zeya Kyawhtin Sein Win, Commander-in-Chief (Navy) Admiral Zeya Kyawhtin Tin Aung San, Commander-in-Chief (Air) General Zeya Kyawhtin Maung Maung Kyaw, senior military officers of the Office of the Commander-in-Chief, the commander of Yangon Command, the acting commandant of OTS (Army), senior military officers of Yangon Station, invited guests and parents and relatives of the cadets. First, Senior General Min Aung Hlaing took the salute of the cadet company and inspected it. Then, the cadet company saluted the Senior General through slow-march past and quick-march past. The Senior General presented Best Cadet Award to Cadet No 9 Cadet Khin Moe Myint. In his address, the Senior General dealt with the nurturing of servicewomen in the Tatmadaw, saying the role of women has been broadening globally, and there are brilliant women intellectuals as well as women who are taking the top positions in the politics and governments. The UN and the international forums are discussing the enhancement of the role of women, and Myanmar has been giving priority to the task. The role of women in the global armed forces is also developing significantly, and they are shouldering important duties. 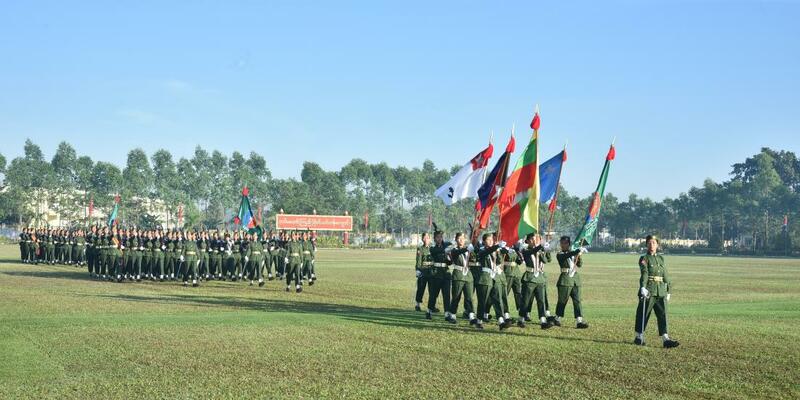 The Tatmadaw with the aim of producing servicewomen (officers) to enable servicewomen to take part in the national defence duty is conducting military courses for women including the female cadets’ course. If the abilities of women in the history of the Tatmadaw are studied, the record of Myanmar patriotic forces including women daringly fighting back the British troops in the Battle of Wethtikan during the First Anglo-Myanmar War can be found. After the independence was restored in 1948, servicewomen were assigned as officers and other ranks in the corps and rescue units. 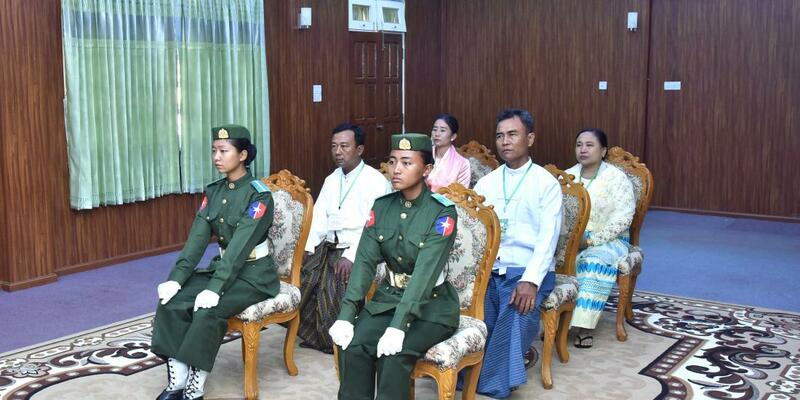 The Tatmadaw has been producing graduate women officers again and assigning them duties to uplift the role of servicewomen. Of the women officers, six were successively trained as the first women pilots of the Tatmadaw (Air). They are now standing shoulder to shoulder with the male counterparts in serving as air force pilots. After gaining more experience, they will be trained to fly fighters and jet aircraft. In the ASEAN shooting contests, servicewomen win gold medals annually. The qualifications of servicewomen have reached that level. 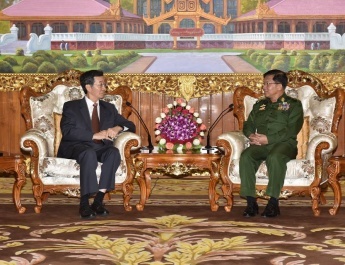 As regards the national defence duties and regional development undertakings of the Tatmadaw, the Senior General said Tatmadaw members should brilliantly serve their duties to safeguard the State and the people, with determination and the sacrificing spirit. The Tatmadaw is only defending against those attempting to harm State peace and stability, government machinery and lives and property of the people and danger of armed groups. You are required to help local people in the areas where you are assigned as much as you can to develop their socio-economy and their own regions. You also need to help with rescue work on a timely basis in times of natural disaster and other regional welfare tasks such as education and health affairs. 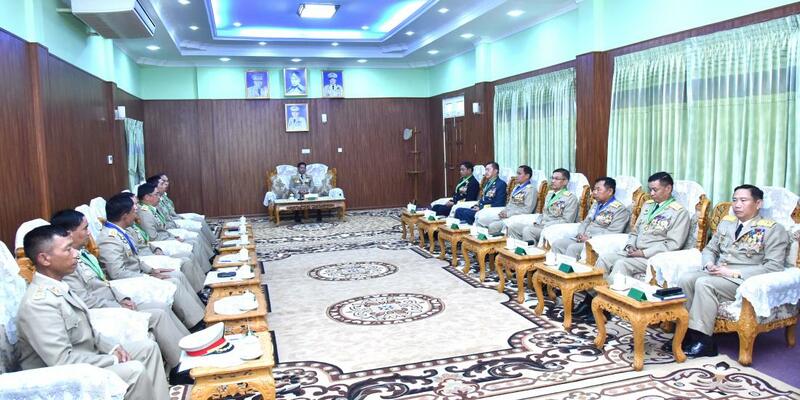 Speaking about unity within the military unit, the Senior General said: Unity within a military unit must be forged by considering and reviewing instigation and various attacks on the Tatmadaw. In the insurgents’ attacks on military regiments and headquarters, the ability of soldiers and their families to fight back is a good example of unity. Proudly, I want to say that our Tatmadaw is formed with not only nationalistic, patriotic and brave soldiers but also their wives as a major auxiliary force for the sake of our country. 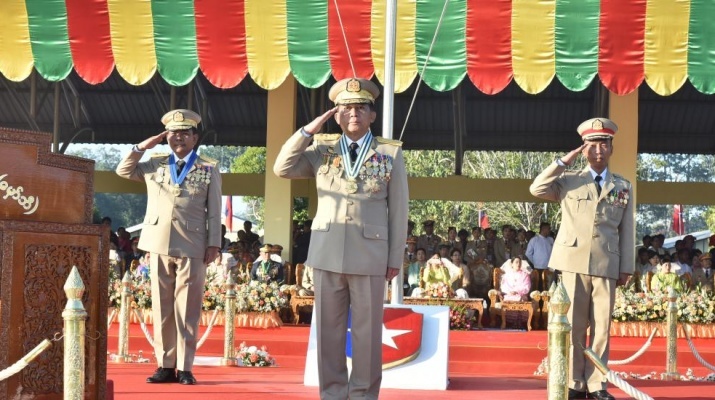 As for achieving eternal peace by ending internal armed conflict, the Senior General said: Since regaining independence in 1948, Myanmar has been trying to end ethnic armed struggle stemming from different ideologies and ethnic issues. 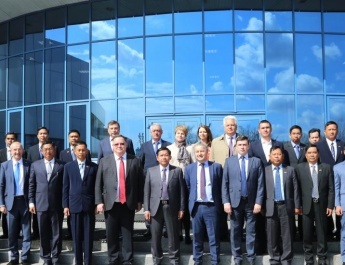 Peace offer was made for ethnic armed groups because ideological differences and misconceptions in ethnic affairs must be resolved within the framework of law only. All states and regions of Myanmar are inhabited by all nationalities, not a single national race. There is no place where rights and privileges are given to only a single nationality. The constitution gives equal rights to all national races living in Myanmar and emphasis is placed on their regional development. The Tatmadaw has announced a cessation of military operations until 30 April 2019, so ethnic armed groups need to participate in the peace process if they accept democracy and national development through national unity and solidarity. The Tatmadaw for its part will be render necessary help. With armed conflict and instability, Myanmar cannot strive its utmost to develop and has lagged behind even in the ASEAN community. To catch up with other countries, we have to take many steps forward while another takes only a step forward. In this context, we need to be united in working for the development of our country by cultivating ‘Myanmar spirit’ without regional, racial or religious discrimination. At a time when efforts are being made for peace and development of our country, you must do your bit. 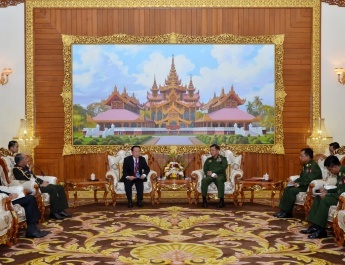 I want to urge you not to tarnish the national goal and the Tatmadaw’s image because of your own behaviours or words. Then, the Senior General took the salute of the cadet company and left the parade ground. After the parade, the Senior General met with best cadet award winner Cadet Khin Moe Myint and best shooting award winner Cadet Naw Aye Myat Thwe and their parents and gave an honorary speech at the villa of OTS (Hmawby).